Many animals use echolocation to help them navigate their environments. Bats are often noted for their amazing echolocation skills. Animals with the capability to use echolocation are mainly nocturnal animals or animals that reside in areas with limited sunlight or none at all. With animal echolocation, an animal produces sounds outwards to its environment and then receives echoes from the reflections of the emitted sound waves and use these echoes to establish the position of objects. Animals use their brains to correctly identify the distance and size of the objects from which the echo emanates by calculating the time used by echo to reach the animal and even the loudness of the echo. The term “echolocation” was first described by Donald Griffin, an American zoologist in the early 20th century after Donald and his colleague, Robert Galambos demonstrated the use of echolocation in bats in 1938. However, other scientists had brought forward the theory of animal echolocation much earlier such as Lazzaro Spallanzani who in the 18th century had established through a series of experiments that bats used hearing for navigation instead of sight. Other scientists who had similar theories were Sir Hiram Maxim who proposed the idea that bats emitted sounds at low frequencies and Hamilton Hartridge who corrected Maxim’s theory and established that the sounds emitted by bats were, in fact, audible to humans. Animal echolocation in marine mammals had not been established until 1953 when Jacques Yves Cousteau proposed the use of bio-sonar by toothed whales in his “The Silent World” publication. Bats were the first animals to be discovered as using echolocation for navigation and foraging and particularly among microchiropteran bats. These species of bats usually live in complete darkness, and therefore the use of sight for navigation is almost obsolete. 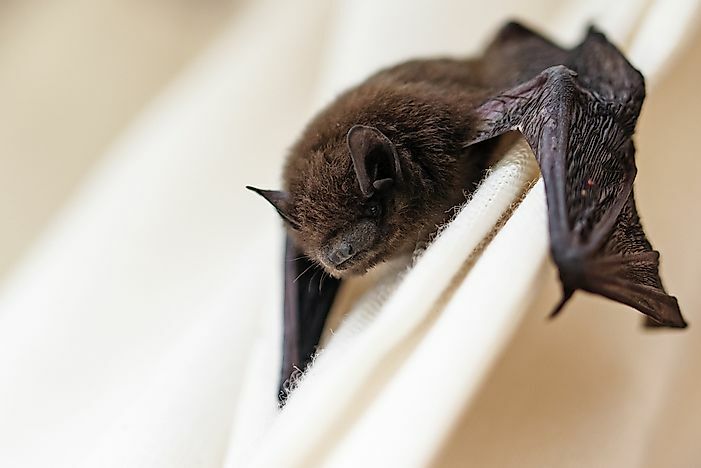 Such bats are primarily insectivores who are also nocturnal hunters, moving from their hiding places in complete darkness when the insects are in plenty, and competition is low. Microchiropteran bats emit sounds from their larynx and through their open mouths. These sounds are usually at extremely high frequencies ranging between 14,000 and 100,000 Hz. For comparison, the human auditory capacity ranges between 20 and 20,000 Hz. Horseshoe bats are an exception as the species use their noses to emit the sounds instead of their mouths. When hunting, bats produce click sounds at a rate of 10-20 clicks per second but after identifying the prey item, the click rate increases dramatically up to 200 clicks per second. Echolocation is also common among other animal of the suborder Odontoceti or toothed whales including dolphins, orcas, porpoises, and sperm whales. These marine mammals adapted to the use of echolocation to supplement the use of sight which is hindered by the poor underwater visibility caused by turbidity and absorption. These toothed whales emit high-frequency sounds in the form of high-pitched clicks which are generated from the whale’s phonic lips. These clicks are produced at varied frequencies with some species producing 600 clicks per second in what is known as the burst pulse. The diverse rates of the clicks give rise to a wide array of sounds including barks, growls, and squeals. The echoes are then received through fatty structures located in the whale’s lower jaw. There are few species of birds which use echolocation for navigation. These include the oilbirds as well as the swiftlet which have been observed using echolocation when flying in complete darkness. These bird species are also nocturnal animals and reside in poorly lit habitats such as caves. Echolocation has also been observed in small terrestrial mammals including the Eurasian shrew, the short-tailed shrew, the wandering shrew, and the tenrecs (found in Madagascar). These small mammals have a distinct form of echolocation where they do not produce clicking sounds as observed in bats but instead produce low amplitude, multi-harmonic sounds, and frequency modulated frequency. These tenrecs and shrews use echolocation entirely for navigation purposes. Echolocation has also been observed by scientists in blind lab rats. Humans have been studied and established to use echolocation to navigate their environments. Echolocation observed in humans is similar in practice to the echolocation in animals as it is also a form of active sonar. Humans employ echolocation through artificially creating sounds such as tapping using a cane or stamping the ground with one's feet or even through creating click sounds. Such individuals are usually trained to use the echoes reflected from objects to identify their distance from an object or the size of an object. Echolocation is observed mainly in blind people, but people with sight are also able to gain the ability through training and negate the precedence effect. Hearing and vision have been studied to be related as in both cases reflected waves of energy from a particular source are processed. Humans were found to have the ability to locate objects without the use of sight as early as 1749. Initially, scientists believed that pressure changes on the skin caused the ability. However, it was in the 1950s that human echolocation was extensively studied particularly at the Cornell Psychological Laboratory. There were several books written in the mid-20th century which deciphered human echolocation further. Individuals who have the ability to use echolocation are usually visually impaired. One of such people who has awed the world with their echolocation abilities is Daniel Kish, a blind man who had his eyes removed in his infancy due to retinal cancer. Daniel employs the use of palatal clicks to identify his surroundings, a skill he taught himself since childhood. Another notable individual with an echolocation ability is Ben Underwood. Ben Underwood is also blind and also lost his eyes after a retinal cancer diagnosis. Underwood gained echolocation abilities at the age of five through self-training. Through echolocation, the blind Underwood was able to run, ride a bicycle and even play football.